Our popular Bagel Books are back! 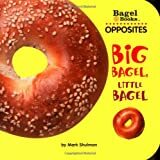 Using a familiar and favorite food of toddlers and adults alike, these bagel-shaped board books with simple text teach early-learning concepts-shapes and opposites-in a fresh, fun way. Young children will love looking at the opposite bagels-like whole bagel/half bagel, light bagel/dark bagel-in Big Bagel, Little Bagel, and the variety of shaped bagels (a triangle, a diamond, even a star!) in My Square Breakfast make learning shapes more fun than ever.